Click here for details for the Scrub Bucket Project - what is involved in making one! Please call Suzanne, the project coordinator for Immanuel, to make arrangements to deliver your buckets. Drop off during school hours 7:30 am to 3:30 pm or Sunday mornings 7:30 am to 12 noon. End date of Saturday, October 27 for drop-offs. 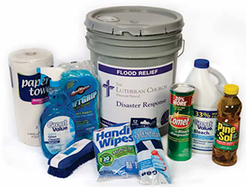 Contact Pastor Matthew Hoffmann at (847) 823-6656 to make arrangements to drop off completed buckets. The HDI office is located above the book store in the Student Services Building. If you are just dropping off a bucket, pull up to the semi-circle in front of the building and put on your blinkers. Once you enter the building, go up the stairs to the right and we are the first office to your left. If you or someone you know owns, wants to rent a truck, or has access to a semi-trailer to haul the Scrub Buckets - call Tim Hetzner at LCC at 866-455-6466.